I only need to think about the sun and I go pink. This was pretty torturous when I was little. 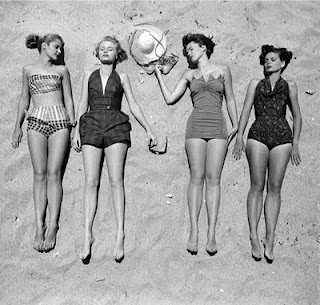 And as a teenager you can imagine the angst when all my friends were slathering on the factor 2, Hawaiian Tropic, . Even after five years living in the South of France - to Chaz's absolute glee - my shins remained blue. I've tried endless sun creams and have fought with most of them. They're either too greasy, too white, too thick or make me spotty. I do however have a new, incredible one. My Mum brought it back from Greece last year for me and I wasn't especially hopeful. 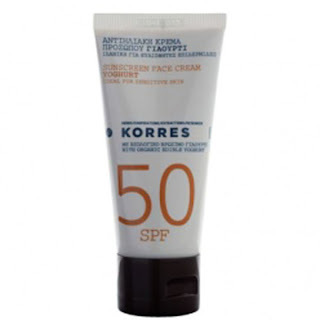 It's Korres which has never been one of my faves but I gave it a go. A year on, we've just come back from Greece - the home of Korres - and my airport shopping basket was filled purely with boxes and boxes of it. It's yoghurt flavour, factor 50 and miraculous. It's ticks all my very demanding boxes. If you're heading for the sun this summer and need some suncream, put this at the top of your list. You'll never go back.